Une unité confortable et élégante de 2 chambres pour 4 personnes qui est à la fois paisible et relaxant. Il est proche de certaines des meilleures fermes viticoles de Constantia. La belle plage et le port sont à seulement 3 km, tandis que le V & A et le centre-ville sont à seulement 20 minutes en voiture. Il est attaché à la maison principale et a sa propre entrée privée, véranda et zone braai (barbecue). Parking sécurisé sur place. Les clients sont invités à profiter de la magnifique piscine ou siroter des cocktails sur le bureau tout en regardant la mer et le coucher du soleil. Il est à 10 minutes à pied de la plage, des transports en commun, des restaurants et des boutiques. Fourni dans l'unité: WIFI gratuit non plafonné; café, thé et sucre; douche avec serviettes, papier toilette, savon pour les mains et lotion pour les mains; lit double dans chaque chambre; kitchenette entièrement équipée; sèche-cheveux; bouilloire braai (BBQ / Weber) et ustensiles de braai. From the moment we arrived at Stoneyview Michelle made us feel really welcome as did her dog Blue who greeted us each morning and welcomed us in the driveway after we had been out for the day. Michelle even left a bottle of wine and some sweets for our first evening in the cottage. She provided us with lots of useful information about local restaraunts and shops and was easily contactable for any queries we might have. We had a wonderful relaxing staying at the property, which is really peaceful. The accomodation itself was extremely comfortable and clean with decor in keeping with the setting. All the amenities we needed to make meals were available. Michelle even arranged for our clothes to be washed and hung out to dry on the Monday after we arrived. She also provided lots of interesting books to read both fiction and non-fiction and some games to play, which were very useful on the one or two rainy days during our stay. There is an area to sit outside to have breakfast and a beautiful decking area around the swimming pool with sunloungers and outdoor furniture, which has magnificent views over Hout Bay. There is also a shaded area in the garden with a hammock and table and chairs, where we were able to cool off and have a relaxing lunch. The property is within walking distance of the local shops and restaraunts and the beach, although it is a steep walk up the hill back, so we tended to drive however this would be doable in an Uber also. Stoneyview is in a great position to get to Chapman's Peak Drive, Constantia wine estates and Kirstenbosch and many other places besides. If you didn't have a car I believe it would be fairly easy to get around on the red hop on hop off buses. We had an amazing stay at Stoneyview and thanks so much Michelle for making our time at your place so memorable and for your fantastic hospitality, we would definitely stay at Stoneyview again if we came back to Capetown, many thanks Adrienne and Lionel. We very much enjoyed our stay with Michelle at her beautiful home tucked onto the mountainside. The moment you enter her gate her sweet dog, Blu, is there to greet you. The two bedroom is attached to Michelle’s house and has its own entrance, kitchen and bathroom making it very private and secure. 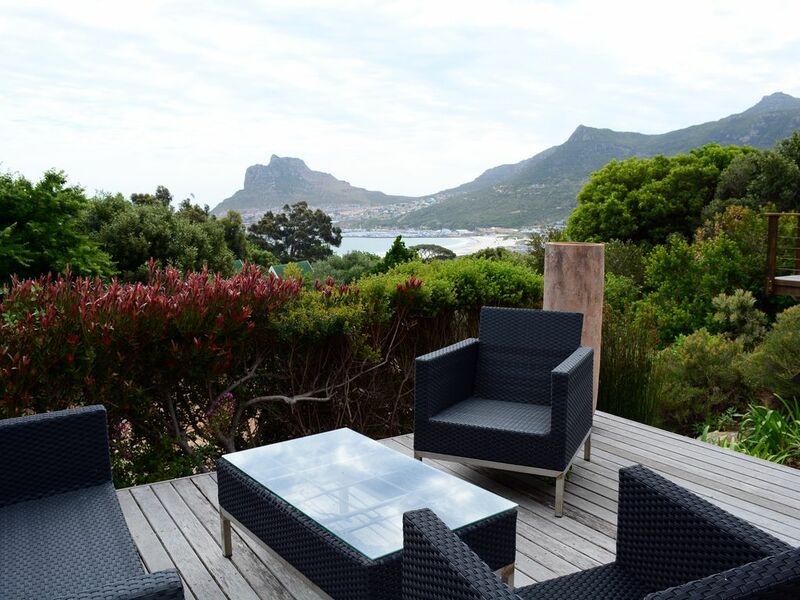 The backyard and pool sit with dramatic mountain views and views of Hout’s Bay. Michelle was there to answer all of our questions but at the same time gave us plenty of space and privacy. We would highly recommend a trip to Hout’s Bay Market on Friday night - great food, music and shopping. We thoroughly enjoyed our stay here and would come back again in a heartbeat. Thanks so much Michelle! Thank you for this great review. You were wonderful and friendly people to host, making it a pleasure! You are most welcome anytime. Please come back soon, Blu misses you! !